You ran 10 miles. You finished those miles on the 50-yard line at Chicago's Soldier Field. You did it all on the Saturday of Memorial Day weekend. So it only seems fitting at an event that celebrates those who've served our country during a pre-race ceremony to see more military honors at the race's end. 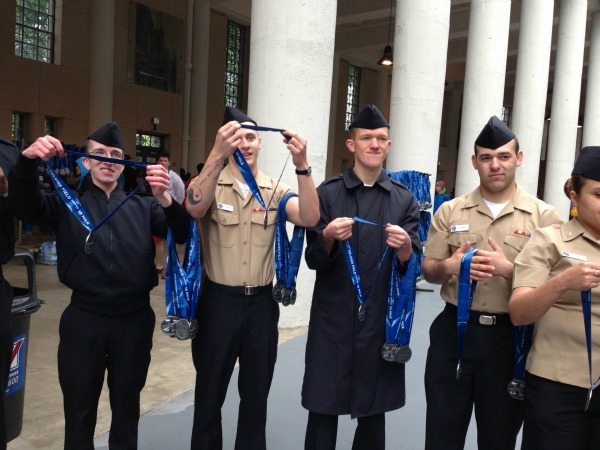 Uniformed officers lined the concourse at Soldier Field to hand out this year's Soldier Field 10 finisher medals--and they were thanking runners for their accomplishments. Maybe I missed something but shouldn't I have been the one thanking them for their service? And why don't I remember receiving my medal from such an honorable group the last few times I've run this race?